Before Maria called us to renovate her bathroom, it was a pink blast from the past and she was determined to make it into the bathroom of her dreams. The old bathroom featured a soaking tub and a separate stand up shower, which was a common design of the houses that were built in that area. The vanity was small and the shower was just taking up space. Maria’s vision was to eliminate the shower and install a great big vanity in its place. 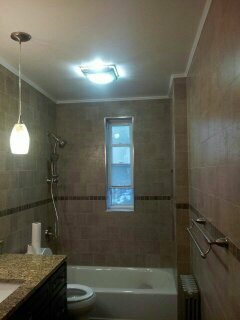 We did exactly that and the new bathroom is spacious and beautiful. After a complete demolition of the existing bathroom and fixtures, we re-framed the bathroom and installed new floor joists for a floor that was in bad shape The bathroom was re-plumbed and re-wired. A new modern style exhaust fan/light combination unit was installed. 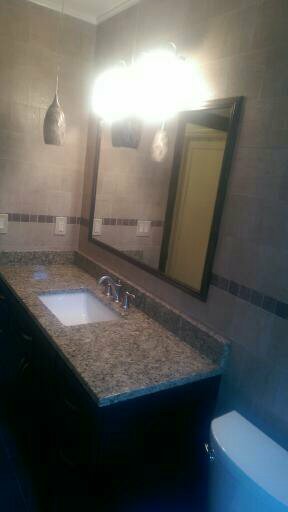 All new plumbing fixtures and a beautiful 60” vanity and granite counter top were the finishing touches to a great new bathroom. Wall tiles were installed floor to ceiling with a special feature tile continuing around the room and gorgeous floor tiles were installed. Recessed soap niches were built and tiled for extra storage. 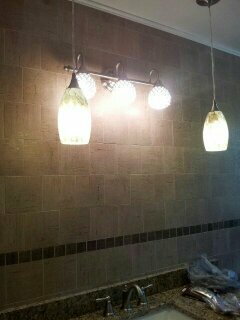 Special “bling lights” and other “malakies” as Maria would say, really give this bathroom a lot of detail and design. A custom made radiator cover completes the bathroom. With the vision of Maria, the delicious home cooked meals from sweet Yiayia, and the dedication of our team we got the job finished.